MR. SURFACER 1000. MR. 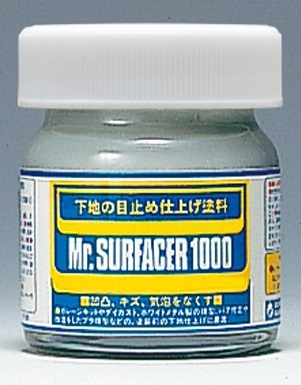 Contains finer granules than Mr.SURFACER 500. They are both used in much the same way but ,due to the finer granules after sanding with waterproof sand-paper , a perfectly corrected surface is possible. . MR. SURFECER 1000 TIENE PARTICULAS MÁS FINAS QUE EL SURFACER 500, POR LO QUE DESPUES DE HABER LIJADO SE OBTIENE UNA SUPERFICIE PERFECTAMENTE LISA. CONTENIDO 40ml.